Playing is the one of the most overlooked pastimes in our increasingly busy lives, but bunnies need it as part of their jobs as foragers. Bored bunnies can become expensive, not to mention dangerous: providing no or limited access to safe enrichment items can result in a bunny getting into trouble by chewing on electrical cords, carpets, floors, furniture, and molding. However, from simple household items like a cardboard to complex logic toys, there are many enrichment options available to satisfy even the busiest bunny! Your bunny’s teeth never stop growing, so providing a variety of bunny-safe chew toys (in addition to unlimited hay) is an excellent way to stave off boredom and promote good health. Toys like seagrass mats or baskets and untreated willow stick bundles, balls, and baskets can be stuffed with pellets, treats, and hay, which helps keep their teeth trim and provides a fun challenge. You can even find willow houses, tunnels, and caves that your bunny can both chew on and hide in! Many toys, like balls in particular, also help your bunny exercise; as your bunny is foraging, she is also moving around. Some of my favorite willow toys can be found at busybunny.com, and, locally at Phydeaux locations around the Triangle and at Unleashed at AniMall in Cary. One of the most common questions that I get is how to find enrichment toys for your bunny that are not expensive. I’ve got good news: if you look around your house, you’re sure to find quite a few! Empty toilet paper rolls can also be stuffed with hay or treats, but avoid ones with excess glue, as we don’t want our bunnies to get sick! While I’ve found that most bunnies only chew on the ends of the rolls, it’s better to be safe than sorry! Empty paper towel rolls, cut at the seam, provide a great, chewable alternative to a plastic slinky, as the roll has a bouncy motion and can be affixed to the side of your bunny’s pen. Plain, brown cardboard boxes (with no excess stickers or tape) are a favorite; cut a hole on a few sides, and you’ve got a fun house that’s chewable – or stuff it with newspaper or plain, brown packing paper for your bunny to play in and tear up. Phone books are also a ton of fun for rabbits to shred; just be sure to remove any glossy covers, inserts, or magnets. My bunnies love cleaning day: it’s the time when they get their environment changed, from cardboard boxes to different toys to changing out bedding, there’s a lot of fun ways that you can rearrange your bunny’s enclosure so that she doesn’t get bored. One of my bunnies, Samantha, loves to run through tunnels, as do most rabbits, so I like to set up her area so that multiple cardboard boxes and tunnels connect to make a maze; tunnels allows bunnies to feel safe, as they are prey animals and still have that instinct. 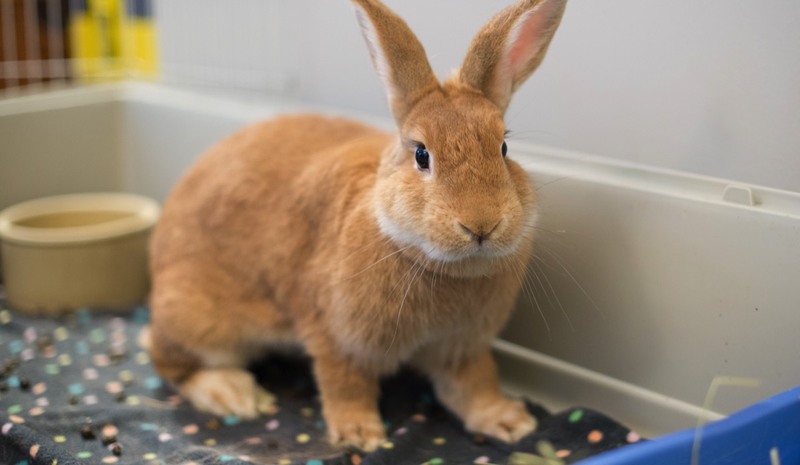 However, they are also quite curious and playful, so I like to place some of her favorite toys (seagrass baskets) just outside of the tunnels and fill them with hay and her favorite treat: bunny biscotti from Bunfectionary, which can be purchased locally from Triangle Rabbits. Another bunny, Mr. Belvedere, loves to perch on top of his boxes, as he loves to be on the lookout, so I place non-skid carpets on the top of them so that he can safely jump up and down. Try different configurations for your bunny to see what she likes best: she may surprise you! The internet is abound with fun ideas for different ways to enrich your bunny’s life, and the possibilities seem endless. I suggest starting out looking online to see what other house rabbit families are doing. Triangle Rabbits has an excellent Pinterest page with lots of great tips and tricks at pinterest.com/trianglerabbit.